Below, Tennessee's state wildflower, the passionflower, entwined in the blackberry bramble. 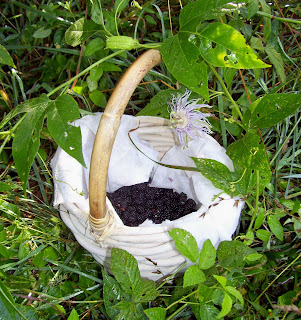 Wild blackberries are free, but they're not without cost. We returned home scratched and scratching. So much for long sleeves and Deep Woods Off! Like most of our frugal enterprises, the real value is in the experience. The sweat and thorns add sweetness that you just don't get from the produce aisle. Making memories, saving money, enjoying an oven-fresh cobbler--what price, happiness? Personal trivia: My husband and I went blackberry picking on our first real date! For our wedding invitations, I used a blackberry stamp. sounds fun! Our blackberries are not even close to being ready yet! How great that you get them earlier in the summer! I love black berries. They are my favorite berry. My grandmother used to make me black berry milk. It was so good. She would use super cold milk, a tad of sugar, and mashed black berries. Mix and drink...so yummy. No ice cream, just the cold milk and the berries. You just brought back memories of growing up in New Orleans. We had blackberries growing wild in the woods across the street from our house. My family enjoyed picking them, but I remember my sister came home with about a billion chigger bites! My husband adores blackberries. He was sad when we had to leave the patch that grew in the backyard of our old house in Tennessee. 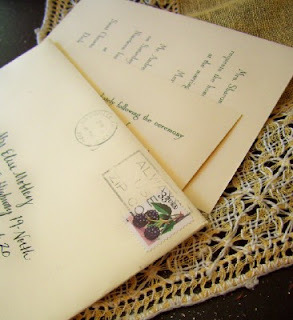 I noticed that the name on your invitations was Mobley. Are you by chance related to any of the Mobley's in NW Tennessee?